The inherent nature of firmware makes it an appealing target for hackers as the hardening of traditional exploit vectors (e.g., operating systems and the applications) is leading to new routes of attack. Join the UEFI Forum Secure Coding webinar to hear the panel of security experts, including Insyde Software's Trevor Western, discuss tips and best practices. The webinar is open to the public and attendees will get the chance to participate in a live Q&A session. Join Insyde Software at Embedded World 2019! Our booth will be located with our Europe partner, Logic Technology, in Hall 4 / 4-639. Register today for the Embedded Systems Conference to attend this presentation! Join Insyde Software at Computex Taipei 2018! Be sure to catch our technical session on Wednesday! Tim Lewis, Insyde CTO, will be presenting a technical session titled "UEFI and the Security Development Lifecycle." Learn more or register to attend at the EW2018 website! As a leading provider of UEFI firmware and systems management solutions, Insyde Software helps systems makers around the world architect, develop and validate enabling firmware and software technologies found on all types of embedded and Internet of Things platforms. Visit Insyde Software at Embedded World 2017 to learn more about how Insyde can help you develop, build and deliver timely new connected devices to market. Insyde Software will be co-exhibiting with partner Logic Technology at Embedded World 2016. Visit us to learn more about InsydeH2O, Insyde Software’s flagship UEFI firmware solution, which supports a comprehensive suite of features targeted at embedded applications and is optimized for fast boot on x86 platforms. In addition, see the latest in innovative boot loader solutions for IoTG devices, Android and Linux solutions and customized engineering services. See our official IDF15 San Francisco event invitation! Insyde Software will be co-exhibiting with partner Logic Technology at Embedded World 2015. Visit us to learn more about InsydeH2O, Insyde Software’s flagship UEFI firmware solution, which supports a comprehensive suite of features targeted at embedded applications and is optimized for fast boot on x86 platforms. In addition, see the latest in innovative boot loader solutions for IoTG devices, Android and Linux solutions and customized engineering services. See the post-event update at the Insyde blog! 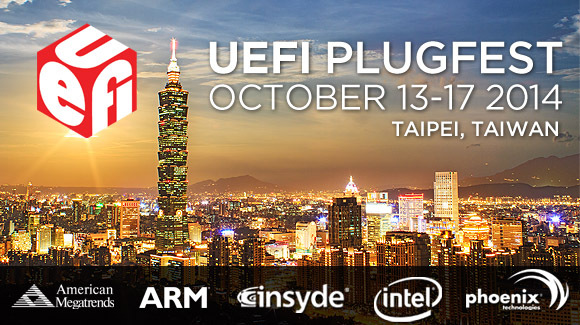 The UEFI Testing Work Group (UTWG) and the UEFI Industry Communications Work Group (ICWG) from the Unified EFI (UEFI) Forum invite all UEFI members to the upcoming UEFI Plugfest being held October 13-17, 2014 in Taipei, Taiwan. This event is being hosted by the UEFI Forum and Insyde Software, with American Megatrends, ARM, Intel and Phoenix Technologies as event sponsors. Please Visit the UEFI Website for the latest official event information! Click here to see our event preview! Please visit us during Computex at the Grand Hyatt Hotel, Suite 2408 from June 3rd-6th, 2014. Insyde® Software will demonstrate how combining its industry-leading UEFI firmware and robust x86 Android™ software can help embedded systems makers deliver innovative and powerful intelligent systems to the market. InsydeH2O® UEFI BIOS provides platform readiness for the latest x86 embedded platforms from Intel® and AMD, in addition to high reliability, security, advanced firmware features, and dedicated engineering support. When combined with a unique array of products and features from Insyde’s Software Platform for Android, including quick OS switching and concurrently running Android apps, embedded systems makers can more quickly develop and deploy innovative and reliable intelligent systems featuring Android. Looking for our Android BSP resources for Intel CRBs? Click here. A Unique Training Event from Insyde Software - Learn to Harness the Latest in Firmware and Software Technologies! This fall, Insyde Software is hosting a special event where a number of the industry’s brightest firmware engineers from Insyde Software will provide in-depth training over the latest in computing technologies. From our EDK2-based UEFI firmware to our latest development tools and Android implementations and solutions, those in attendance will learn how these technologies can be leveraged to help deliver next-generation innovative platforms to the market. Technical sessions at the Insyde Software Developers Forum will include deep-dive presentations, in-depth Q&A sessions, "chalk talks" (meet with engineers as they visually examine new technologies step-by-step), and more! The Insyde Software Developers Forum has an event attendance fee of NT$2500. Talk to your Insyde sales representative for invitation promotions such as early-bird registration and other offers. Please contact your Insyde Sales Representative or e-mail us to learn more about this special event. See Insyde Software's Latest Firmware & Android Solutions at Booth #551, and attend our technical session & poster chats, listed below! This session will help demonstrate how system firmware and option ROMs can work together to preserve run-time firmware integrity in modern multi-OS enterprise platforms. Click here to learn more. STTC003 - Wind River Simics* Gives Boot Code a Boost – Insyde* Software Case Study on Accelerating Firmware Development Pre-Silicon. Click here to learn more. Join Insyde Software at the Intel Ecosystem Symposium! The Intel Ecosystem Symposium will feature morning keynotes covering Intel's mobile vision and software efforts, followed by an in-depth afternoon of various tracks covering exciting new user experiences centering on: technologies, operating systems, usage models, applications, and hardware. We will be presenting a session at the UEFI Summerfest in Redmond, WA called: “Advances in UEFI Secure Firmware Update.” Make sure to stop by our testing suite and say hello to the Insyde team! See our latest news from Computex! 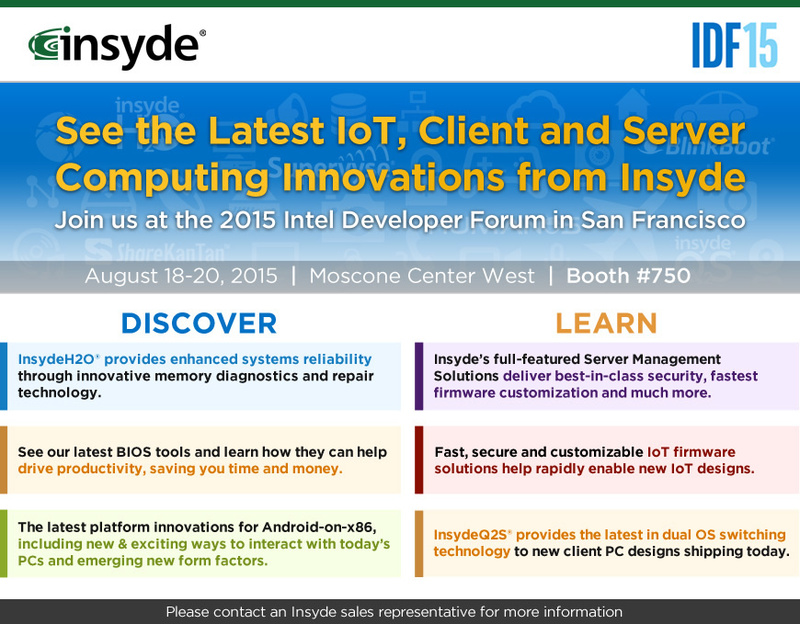 See what's next at Insyde Software's Booth and start what's next with us. Learn about how our advanced Android products and services can help you to confidently deploy and support your next platform. We’re presenting a session at the UEFI Plugfest on March 18th in Taipei called: “Implementing Secure Boot: A Refresher on Key & Database Configuration” We’re also going to show a handy utility that helps check the UEFI secure boot configuration of your system. Make sure you stop by our suite and say hello to the Insyde team. The embedded world Exhibition&Conference is the world's biggest exhibition of its kind and the meeting-place of the international embedded community. Embedded technologies are in action everywhere - whether in the car, data and telecommunication systems, industrial and consumer electronics, military systems or aerospace. Register today for the Insyde Technology Conference to learn how Insyde can provide you with trusted, leading-edge firmware solutions and services that can give you an edge in the market while also saving your projects valuable development time. This event will show you how our innovations and approach to development allows us to consistently provide our customers with exceptional and differentiated technology that can result in better products reaching the market faster. The 2012 Presentation Files are Now Available! The 10-in-10 is a one day conference that brings together industry leaders to share technology insights, strategies and advancements that drive the client and server computing markets. With presenters that include leading technology companies such as Intel, Microsoft, ARM Holdings, and Texas Instruments, the 10-in-10 computing conference provides Taiwan's computing community a unique and valuable opportunity to exchange ideas and future visions for the state of computing technologies. Visit the 10-in-10 event page for more information! IDF is where people from every part of the technology industry gather to hear about Intel’s latest advances. The conference provides a rare chance to engage and learn about Intel products across the entire compute continuum. For over a decade IDF has been Intel’s premier conference, helping to shape the direction of tomorrow’s technology. Join us at IDF 2012 San Francisco, and see where tomorrow’s technology will take you. Insyde Software will be joining other computing technology leaders at the inaugural Digitimes Ultra Mobile & Ecosystem Forum. This event will provide key industry players an opportunity to analyze and discuss key technologies that are driving the massive growth of the ultra mobile market segment. Visit our booth (#GE06) at IDF Beijing to learn more about how our industry-leading products and services prepare our customers for the future. PTAS004 - Implementing Platform Security with UEFI, presented by HP, Insyde Software and Intel. With presenters that include leading technology companies such as Intel, AMD, Microsoft, and ARM Holdings, the 10-in-10 computing conference provides Taiwan's computing community a unique and valuable opportunity to exchange ideas and future visions for the state of computing technologies. Save the date for the return of Plugfest to Taipei in 2011! The UEFI Plugfest event provides the computing industry with an opportunity to conduct a variety of interoperability tests with implementers and implementations of UEFI among the UEFI community. This event will allow add-in cards to run the UEFI SCT on various UEFI system implementations and to test using a variety of Operating Systems. Visit the UEFI website for more information! Intel Developer Forum is held every year, allowing brilliant minds to meet, collaborate, and learn from one another. The event offers an invaluable opportunity to hear major announcements and get critical job training. Attendees can ask questions and get answers from top engineers who come equipped with extensive knowledge on next-generation processor technologies. July 6-9, 2011. Redmond, Washington. Microsoft Campus. The UEFI Plugfest event provides the computing industry with an opportunity to conduct a variety of interoperability tests with implementers and implementations of UEFI among the UEFI community. This event will allow add-in cards to run the UEFI SCT on various UEFI system implementations and to test using a variety of Operating Systems. This event will be held at the Microsoft campus in Redmond Washington USA in July 6-9, 2011. The event will be located in Building 20 at 157th Avenue NE and 36th Street in Redmond. April 12-13, 2011. China National Convention Center. Beijing, China. Insyde Software, in participation with Intel, AMD and the UEFI Forum are honored to host the 10-in-10 computing conference, giving speakers and audience members an opportunity to exchange ideas and future visions for the state of computing technologies. This 1-day conference will bring together industry leaders to share technology insights, strategies and advancements driving the client and server computing markets. The UEFI Testing Work Group (UTWG) and the UEFI Industry Communications Work Group (ICWG) from the Unified EFI (UEFI) Forum would like you to save the date for the upcoming UEFI Plugfest event being held this fall in Taipei. This event is being hosted by the UEFI Forum, Insyde Software, and Intel.